Cutting edge, biometric locks are a great way to ensure that only authorized individuals have access to your property. We can install, repair, replace, upgrade, and reprogram biometric locks for your home or business at any time that is convenient for you. Our lock services are available to you 24-hours a day and we are fully licensed, bonded, and insured so you know you are getting the best services possible. Call now to make an appointment or request emergency locksmith services. When you require assistance installing, maintaining or repairing an innovative new lock system, count on the highly trained experts at Pros On Call. Our lock service experts possess the expertise required to work on a variety of different locking mechanisms for all types of biometric lock systems. Our skills help our customers enjoy enhanced security with the assistance of high-tech locks, biometric locks and sophisticated digital access control and commercial security systems. We furnish a full array of rapid commercial, residential and automotive locksmith services too. Pros On Call, operates as a local mobile locksmith. We’ll send a team of trained technicians with five or more years of experience to your location to provide 24-hour locksmith assistance. Call us whenever you need a capable emergency locksmith. Our licensed, bonded and insured company responds within 30 minutes (or less) to customer requests. Today, a rapidly growing number of companies manufacture biometric door locks. Biometric security tools rely on an individual’s unique physiology or behavioral characteristics to furnish identification and authentication. Inventors have devised a variety of biometric scanning processes. These range from fingerprint and voice pattern identification systems, to retinal scans and face recognition systems. 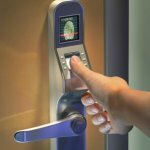 Our skilled experts can help you install and maintain any type of commercially available biometric lock. And we can help you determine which system is right for you. Homeowners today sometimes use biometrics to enhance residential security. If you would like to request biometric locks for this purpose, count on our mobile teams of locksmiths for complete assistance. We also perform other skilled residential locksmith services, including lock repair and replacement. Contact us for assistance resolving any emergency requiring the skills of a trained locksmith, such as a home lockout or a broken or jammed door key. Does your company seek qualified installation for a commercial biometric security system? We provide an excellent resource. Our firm uses the talents of highly trained commercial locksmiths. Ask us to help you assess and select the best biometric devices to meet your security needs. We assist commercial enterprises of every size. Our technicians perform complete lock installations. Ask us to install a new biometric device or system for you. If you’ve encountered problems with one of your biometric security devices, consider contacting us for fast, capable repair assistance. We can repair damaged biometric systems quickly. We’ll help you assess the extent of the damage to your locks. We can also recommend additional effective security options to assist you. 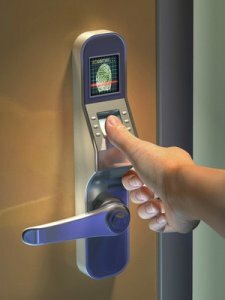 Call us today to seek biometric lock system services. We hope you’ll select Pros On Call to help install, maintain or repair these innovative new locks. We’ll also assist you with any other lock-related concern so request our locksmith services today! Biometric Locks https://prosoncall.com/locksmith/lock-services/biometric/ 3.8/5 based upon 23 reviews.